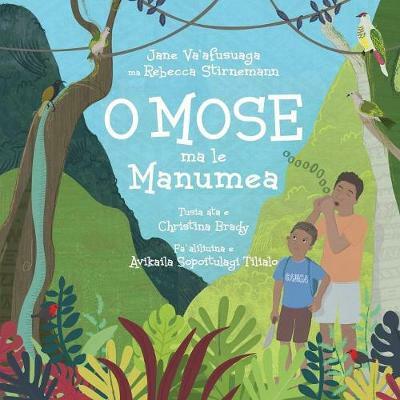 A Samoan story of adventure as two boys search for the manumea. Their thrilling journey takes them from the village at the coast to the dark forest, discovering wonders along the way. Mose and the Manumea is designed to be read independently by 8-10 year olds and to be read aloud to younger readers. It can be enjoyed by families and also used as a valuable interactive conservation resource in classrooms. An educational resource containing facts about the manumea and other endemic species of birds. It raises awareness about the importance of protecting the manumea - the critically endangered national bird of Samoa. Proceeds from sales of the book will go towards conservation of the manumea initiatives in Samoa. Jane Va`afusuaga is a New Zealander living in a rural village in Samoa where she and her husband, Olsen, run an ecotourism venture and are passionate about conservation. They are currently involved in a community-based project creating a sanctuary in the rainforest to protect the critically endangered manumea and other native species of birds. Jane hasn't seen a manumea yet, but she and her young daughter are always on the lookout and are hopeful they will spot one during their lifetime. Jane's other passion is to write children's stories set in Pacific Island communities in New Zealand and Samoa. Rebecca Stirnemann is a passionate scientist working on endangered birds and forest conservation. She spent seven years working on protecting the native birds of Samoa, including the manumea or tooth-billed pigeon. She has been lucky enough to see manumea in the wild and hopes that one day their numbers will increase so others can also see this princess of the forest. Rebecca's research has shown that a mix of hunting by people, invasive predators such as rats and cats, and loss of forest threatens both the manumea and other native bird species. Luckily there is a great team of people working on helping the manumea. Christina Brady is an artist and potter. With very few materials she can create a masterpiece. Originally from England, she now lives in Queenstown, New Zealand, where she is inspired by the nature that surrounds her. She is often found mountain biking the steep hills or skiing the slopes - in contrast to a few years ago when she lived on a yacht and sailed around the world.